Tired and sore, you struggle over the burning sands toward the long-forgotten city. Will you reach the place in time to save yourselves from the evil efreeti? The sun beats down, making your wounds stiff and worsening the constant thirst that plagues anyone who travels these waterless wastes. But there is hope - are those the ruins over there? A hush falls over the ruins, making the back of your neck prickle. Then, out of the east, a wind rises, gentle at first but quickly growing stronger and wilder, until it tears at your clothes and nearly lifts you off your feet. The once clear sky is choked with white and grey clouds that clash and boil. As the clouds blacken day turns to night. Lightning flashes followed by a menacing growl of thunder. You are beginning to wonder if you should seek shelter, when all of a sudden there is a blinding crash and a bolt of lightning reduces the statue to dust. For a moment, silence. The, out of the statue's remains, soars a blue flame. Its roar deafens you as higher and higher it climbs, until it seems about to reach the clouds. Just when you think it can grow no larger, its shape begins to change. The edges billow and soften, their roar lessens, and before your eyes materializes a gigantic blue man. This adventure can be played alone or as the second part of the Desert of Desolation series. For characters level 6-8. 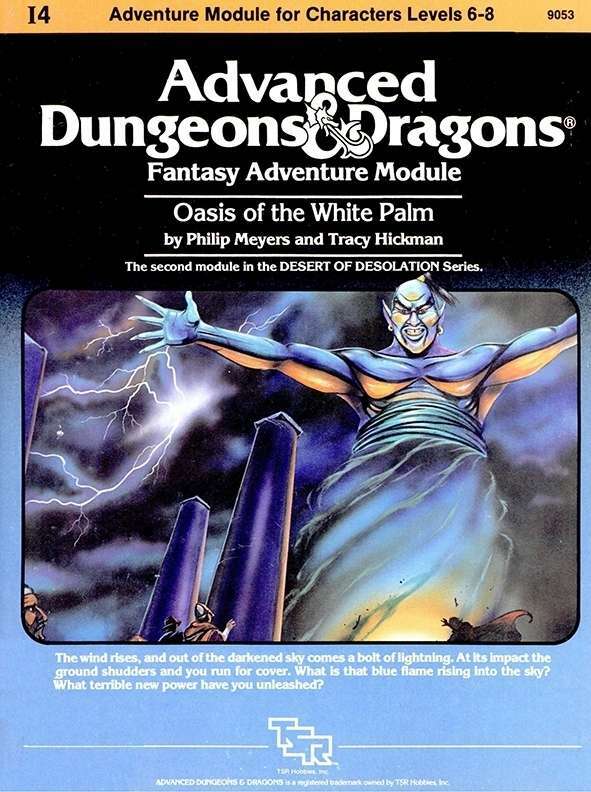 I4: "Oasis of the White Palm" (1983), by Philip Meyers and Tracy Hickman, is the fourth I-series ("Intermediate"-level) adventure for AD&D and also the second release in the "Desert of Desolation" trilogy. It was published in February 1983, just a month or two after the previous adventure in the series. Continuing the Story of the Desert. The first adventure in the "Desert" series, I3: "Pharaoh" (1982), was originally written by Tracy & Laura Hickman for publication by their own small press, DayStar West Media, in 1980. When Tracy Hickman came to TSR, he brought "Pharaoh" with him. TSR not only published "Pharaoh," but they also asked Hickman to adapt a product they had on-hand in order to continue the Egypt-themed story. Thus Hickman took on Meyers' "Oasis of the White Palm" and made it the second of a three-part adventure. The integration is overall well done, as Hickman focuses much of this new adventure on an efreeti that is accidentally freed in room G7 of "Pharaoh." Rumors within I4 also point to the other adventures in the series. On the downside, the healing of the land that occurred at the finale of "Pharaoh" is largely ignored here. A Storytelling Adventure. When the Hickmans wrote their original publications for DayStar, they included a "manifesto" detailing how their adventures would go beyond the typical dungeon crawls of the era. One of its edicts stated that DayStar publications would focus on intriguing stories that were well integrated into the adventures. Though "Oasis" wasn't originally written by Tracy Hickman, it shares those same ideas of storytelling. There's an efreeti taking over desert lands, an ancient djinni that can be summoned to battle it, an Oasis with warring factions, and a bride that's been stolen. Hickman himself would most famously develop the idea of story-oriented adventures through the Dragonlance series (1984-86), but "Oasis" was still an important predecessor, and one of the earliest TSR adventures with a strong story. Mystery & Politics. "Oasis" also offers different gameplay from a lot of TSR adventures of its era. That begins with numerous roleplaying and politicking opportunities available at the eponymous oasis. Interacting with notable NPCs had been an important element of TSR adventures since at least T1: "The Village of Hommlet" (1979), but the idea of political differences being a focus of an adventure was still pretty innovative in 1983. There's also quite a bit of mystery, focusing on a missing bride. Other early examples of mystery-oriented adventures include U1: "The Sinister Secret of Saltmarsh" (1981), N1: "Against the Cult of the Reptile God" (1981), and X3: "Curse of Xanathon" (1982) - so the idea of mystery-based adventures certainly wasn't unknown by 1983. Expanding the Realms. Like the rest of the Desert of Desolation series, this adventure was eventually subsumed into the Forgotten Realms when it was reprinted as I3-5: Desert of Desolation (1987). A Trap Worthy of Grimtooth. The traps and puzzles included in "Oasis" highlight the adventure as being from the old school, reminiscent of older products like S1: "The Tomb of Horrors" (1978). One trap in particular, the Pit of Everfall, feels like it came right out of Grimtooth's Traps (1981). Future History. Hickman would tie up the Desert of Desolation trilogy with a final adventure, I5: "Lost Tomb of Martek" (1983). About the Creators. Meyers wrote only one other RPG adventure, I7: "Baltron's Beacon" (1985). When Hickman developed Meyers' adventure, it was probably his second work for TSR, following I3: "Pharaoh." He'd see many more publications that same year, including the famous I6: "Ravenloft" (1983). The history of this product was researched and written by Shannon Appelcline, editor-in-chief at RPGnet and the author of Designers & Dragons - a history of the roleplaying industry told one company at a time. Please feel free to mail corrections, comments, and additions to shannon.appelcline@gmail.com.